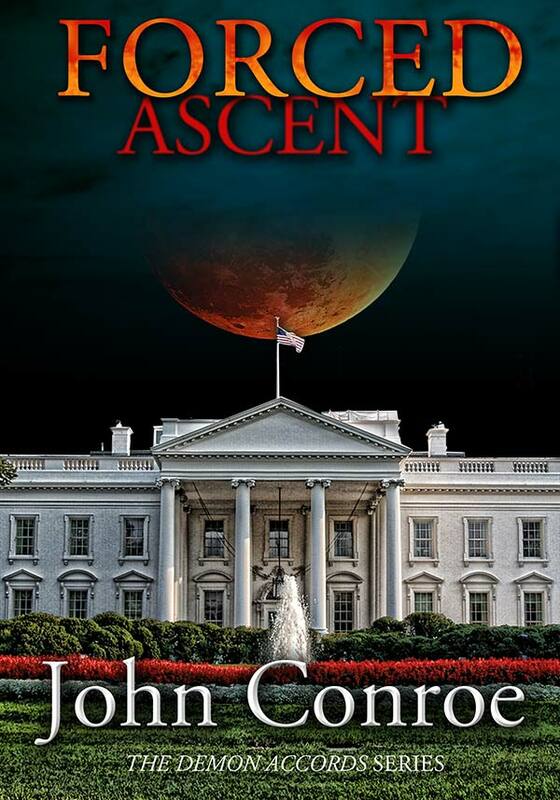 After pulling his goddaughter, Toni, from a secret base in New Hampshire and dropping one little space rock on the miscreants who kidnapped her, Chris finds himself in a tough spot with the White House. Add to that a veritable plague of demons and the impending arrival of the most dangerous holiday of the year, Halloween. Chris and Tanya and their team will have to dance lightly to stay out in front of all their enemies if they’re to have a chance in hell of preventing all Hell from breaking loose. As with all the his other books John Conroe is amazing. Every book just gets better and brings new twist. I don’t normally read a book more than once but I have read all his multiple times just to stay fresh for the next release. I read a little bit of everything SYFY, fantasy, historical, and even some non-fiction, but this is my favorite series to read by far. I’m no critic so my opinion is nothing important but if your looking for a action packed, spiritual, romantic, and humorous book that makes you truly think of the possibilities out there then you will enjoy this book and or course the whole series. The hotel had seen better days—Hell, better decades. It was one of those generic franchises, forgettable in every way. This one had started its life as a sterling example of modern hospitality and gradually tarnished, day-by-day, till it had reached its current state of benign neglect. It was located smack dab in the middle of a really nasty section of Albany. That’s Albany, New York, not the warmer, more Georgian location. The lobby was worn and shabby, even though it was basically clean. The décor was stuck in the seventies and despite the signs proclaiming it to be smoke free, it still stunk of years of free-burning cigarettes. A sign on a pedestal welcomed Pee Wee cheerleading teams to a regional competition, giving me the answer to the burning question of why so many screaming pre-pubescent girls were running helter skelter through the halls and lobby. When I turned to the desk to ask directions, I found both registration clerks and their customers watching me with slightly widened eyes. My first thought was that I had jelly on my face from the half dozen donuts I’d decimated in the car before coming in. After a moment I realized that wasn’t it. That’s been one of the hardest changes to digest—the attention I get. For most of my life, I’ve flown under the radar, drawing little to no attention from my fellow man and woman. But ever since I came to sudden, abrupt awareness in a Carolina forest, staring at a mansion and two giant wolves, that comforting anonymity has been gone, along with two or so years of memories. Now I attract glances and stares simply by entering a room or walking on a street. But let’s be real. That’s the very least of the changes I’ve woken to. My physical abilities, my supernatural abilities, the psychotic combat persona that takes over during violent conflict and fights like a nuclear Bruce Lee, and my involvement smack dab in the center of supernatural politics all overshadow this attention thing. Not to mention that fact that I have a girlfriend. If you can call the future queen of the vampire world, who is the only vampire born to the species, just a girlfriend. Oh, and she’s a self-fallen angel—like me. Yeah, another little bombshell to fall on my head. I was an angel till I volunteered to give it up and fall to Earth and become a human. Hence my odd ability to banish demonkind. My God-given talent. At least, that’s one mystery cleared up, although I’ve got to be the least angelic angel going and I can’t for the life of me remember any angelic memories. But the hardest change, the one that bothers me the most, is the fear. So many of the beings I find myself surrounded with fear me. Vampires, werewolves, humans who know what I can do, all of them smell of fear to one degree or another. There are really only a handful of friends who aren’t afraid of me. But anyway, all four of these women at the check-in desk were just staring at me, their own business apparently forgotten. Of the two behind the counter, one was older, maybe middle-aged. She looked tired, of Slavic descent, and the least impressed. Her coworker was a fresh-faced, early twenty-something, with beautiful mocha-colored skin and brown eyes that were currently ready to pop out of her skull. The two customers were both mom types, my conclusion based on the small child each had clinging to their purses and pant legs. One had heavily constructed blonde hair that weighed maybe as much as the toddler at her feet. The other was a tall black woman wearing an expensive gray pantsuit and flashy red shoes and clutched a designer purse that could double as a carry-on bag. The accent confirmed my guess as to her ethnic background but left me wondering what she’d actually just said. “Thank you,” I said, heading toward the hall and simultaneously dodging three laughing girls. Some older buildings look better the further you go inside them, possibly because the main entrances get the most wear and tear. This wasn’t one of them. If anything, it looked worse. Stains on the industrial red and black patterned carpet, dim florescent lights, and little black streaks around the edges of the doors, about ten inches off the floor. Those had me puzzled until a uniformed maid came down the hall negligently pushing a cart that had black rubber bumpers on its edges about ten inches up. I found the Lake George room right off the bat. The black-suited guard with the white curly cord leading up to his ear was a dead giveaway. So was my attorney, who was leaning against a wall, waiting for me. He straightened up, tugging his two-thousand-dollar Italian suit into perfect alignment with his athletic build. Six-two and a solid two-twenty at a guess, Darion Cornell looked about thirty and could have just as easily been an NFL wide receiver as an extremely well-dressed and very expensive attorney. This was only my second time meeting him, the first being last evening when Lydia and Tanya had set this whole thing up. “You ready?” he asked me, looking me up and down, nodding slightly. I too was wearing a nice suit, although not quite as expensive as his. Tanya, once she had acquiesced to the meeting, had decided I needed to look utterly respectable but not ostentatious. “Who’s in there?” I asked, ignoring the Secret Service guy by the door who definitely was not ignoring me and was having a conversation with his shirt sleeve. “Congressman McFeeney, Senator Gleeson, General Creek, Director Stewart, and a representative of the President,” he said. “And three more of him,” he added, swinging his head toward the bodyguard at the door. “So who’s the leader of this little lynch mob?” I asked. “Which am I? Troublesome or embarrassing?” I asked. “You’re a nightmare of Biblical proportions,” he said, looking down at his hands as he tugged each shirtsleeve into position. I froze up at his words, then realized it was just an offhand comment. Maybe. I nodded, thinking that Tanya would do much better in my place. Not that she didn’t want to be here—hell, it had been a knockdown, drag-out fight, the worst I could remember having with her. She insisted on being by my side, and I insisted that having us both in the same room was too great a temptation for the government not to try something ultra-stupid. She finally settled for picking this out-of-the-way dump, telling them at the last minute, and staying very close by. The guard opened the door, looking slightly offended when five yelling mini-cheerleaders ran by, and we filed into the meeting room. It was part of a larger room but had one of those folding dividers that cut the main room down in size. It was just as shabby as the rest of the place. A pair of long folding tables had been set up with tablecloths. One long side was open and empty, just two chairs, each place set with a pad of paper and a pen. Across the table sat a thirty-something brunette in a red power suit; a middle-aged, ginger haired man in a nice black suit; and a silver-haired gent in a gray pinstripe with suspenders. At the left-hand end of the table, Nathan Stewart, Director of Oracle, sat looking relaxed and comfortable, white mustache twitching, while across the table at the right end sat a salt-and-pepper-haired bundle of tension with a hard face wearing a banker’s gray suit like a uniform. Another Secret Service-type guy stood behind the three politicians, and one stood behind the salt-and-pepper guy who had to be General Creek. Tanya and Lydia had filled me in on him. Apparently I had worked with him but he didn’t like me much—at all. The third and final guard was standing against the wall to the door’s left, leaving him behind Darion and me. We moved to the table and took our seats. Director Stewart stood and shook my hand and introduced himself to Darion. The others remained seated and just studied us. Well, studied me. I folded my hands in front of me and looked up, matching each of their gazes for a moment. The woman, Alexis, didn’t look away, and something about the set of her head and shoulders along with the up twitch at the corner of her mouth told me that she was enjoying this. Her gaze seemed mildly fascinated. Both politicians held my stare for a moment before their eyes slid away, both of them choosing to look at Darion. General Creek watched me like I was a rabid dog. “Nice place you picked, Darion,” the senator remarked with a look around the room. “Well, your client holds the distinction of being the first person to aerially bomb the United States,” Gleeson replied. “Ah, sorry, Senator but that distinction belongs the Japanese in 1942. A sub launched a two-person float plane that dropped two incendiary bombs on the Oregon forest. It isn’t widely known. Also, there isn’t any evidence that my client bombed anything,” Darion replied. The senator frowned and looked ready to continue, but Alexis Bishop spoke before he could, and she spoke directly to me. “Really? An honor? I’m fairly certain not everyone here would call it that,” I answered. I felt myself frowning. I didn’t remember meeting the President, but Tanya and Lydia had filled me in on my most of my adventures, including my Skype call with the Prez. “I have to say you’re not what I expected,” she continued. She smiled and almost chuckled, but she caught it and instead, her smile became something a little hard, a little fierce. General Creek snorted and I inclined my head in his direction while continuing to meet Alexis’s gaze. She smiled again, then let it slide off her face, becoming serious. “Here’s the thing. You, Chris, somehow attacked a military structure on continental United States soil and completely destroyed it. That’s never been done before. It immediately classifies you as a terrorist,” she said. “AIR? Agents in Rebus? That old fairy tale,” Senator Gleeson scoffed. “So you admit that your client assaulted the silo with an airborne kinetic energy weapon?” Alexis pounced. He finished and held both arms open, palms up, with a there you have it look. “Yeah, great definition. But it pretty much classifies everything that you folks do as terrorism. Intimidate or coercion? Sounds like standard politics to me. Congratulations, you all are terrorists, too,” Darion said. “Your sarcasm has no place here, young man,” Gleeson said, leaning forward. “Look, the point is that we all know you can classify anyone at any time as a terrorist by that definition. The real question is what’s your angle? What do you want?” Darion asked. “What we have is a national threat to security wielding unknown abilities or technology, operating at random inside the borders of the United States with no checks or balances. Mr. Gordon here has served his country well over the last few years, but there is nothing preventing him from going off the deep end and assaulting that very same country. How do you think the people sworn to protect this nation from any and all threats feel about a rogue operator who can do the things he can do? It’s frankly worse than allowing test tubes of Ebola to be carted about at random by any federal employee that wants one,” Alexis said. “We want controls in place to ensure Mr. Gordon’s compliance,” she said. “And those are?” Darion asked while my stomach got tight and twisted. “We want young Miss Velasquez in Federal custody. We want a… monitor implanted in Mr. Gordon’s body to track and isolate him. We want him shadowed by government agents at all times.” She sat back, watching us for reaction. I had plenty but I somehow managed to control my initial reaction—or more importantly, Grim’s response. The images in my mind were bloody. Very, very bloody. “Because failure to comply will constitute a declaration of intent to commit further acts of terrorism and war against the United States,” McFeeney interjected. He paused for dramatic effect, which was ruined when footsteps thundered down the hallway outside accompanied by howls of pre-teen laughter. “And once you’ve decided you’re at war with my client, how do you see that playing out?” Darion asked, smiling at the sounds of the kids. “The only way it can, Darion. With the death of Mr. Gordon and all he holds dear. Nobody can hold out against the full weight and power of the United States Government,” Gleeson said, his eyes on mine. “Really? I’ll tell you what I think,” Darion began, but the door to the room suddenly opened and the guard posted outside stepped in. Everyone but me jumped a little at the sudden interruption. The Secret Service guy took one step forward and one to the side, holding the door open for the service cart that came bumping through behind him. It was pushed by an older hotel staff person and was loaded with pitchers of water and glasses. “Sorry to interrupt, but the water you requested is here, Senator,” the guard said, not acting apologetic at all. Everyone looked at the old lady while she clumsily moved the pitchers and glasses to the table—except me. I kept my eyes off her, even as I could feel her moving around the room, her presence bright in my mind. She shuffled and kept her head down, finally completing her task and then awkwardly dragging the cart out of the room. The senator poured himself a glass of water then settled back into his chair, finally looking at Darion expectantly. “Go on, Darion, tell us what you think,” he said. “But that confrontation included an extremely supernatural powerful entity and the full resources of the worldwide Coven. The entity has completely disappeared and the vampire has been severed from the larger organization. You’re on your own,” Alexis said, looking me dead in the eye. Creek’s mouth was compressed in a thin, angry line, but he didn’t answer right away. He just stared at me, the wheels of thought almost visibly turning in his head. “I think I’m having déjà vu. As I’ve advised the President, I do not favor the military option. It’s not viable,” he finally said. “That’s not your call, General. Your only job here is to tell us what it would take to finish off Gordon here,” Gleeson said, voice sharp. “In that case, Senator, in my estimation, as a professional soldier who has closely observed Gordon in action and studied each of AIR’s failed attempts to capture him, we would be fighting a guerilla war on US soil against an opponent who has enormous advantages in urban warfare. I’ve seen Gordon decimate the werewolf equivalent of a company of infantry by himself—in a ridiculously short period of time. From what I understand, his girlfriend’s abilities are comparable and he has an unclassified were of unknown capability. Gleeson was almost purple and the closest Secret Service-type guy looked worried, like he might have to dial 911 and perform CPR. McFeeney jumped in before the senator could unlock his clenched jaw. General Creek’s jaw clenched and unclenched a few times as his eyes moved between McFeeney and myself. “All of them?” McFeeney asked. “And what success rate did your models return?” McFeeney asked. “What about civilian collateral damage?” McFeeney asked. Bishop looked a little uneasy and McFeeney was downright upset. “Well for God’s sake, just flush him into the countryside. Things will be wide open and you wouldn’t have so many civilians around,” Gleeson said after glancing at his fellow political allies. Gleeson had gone pale while McFeeney looked shocked but thoughtful. The congressman turned to Nathan Stewart. “Director, what could your group add?” he asked, flicking a glance my way and then back to Stewart. “You’re not being helpful here, Nathan,” Gleeson said. “Look, I’ve been doing this for over fifty years, this supernatural stuff. I’ve studied everything I could find, traveled the world collecting artifacts, people, and information. I can tell you unequivocally that my friend Chris and his group are pretty much unprecedented. Now, the general here is trained to see threats around every corner. I’m conditioned to see opportunities and allies. So far, Chris has done nothing but help this country. Destroying his natural-born allegiance to the United States would not only be a disaster, it would rob of us of his abilities. You are all concentrating on the fact that he pulled down an asteroid –” Stewart said, but was suddenly interrupted by Darion. I glanced at Darion, who looked thoughtful for a moment before nodding assent. I silently consulted my dark half, Grim, and then considered the amount of help I’d had from my brothers of the Host. Alexis turned to the two professional politicians. “You two through?” Both reluctantly nodded. A flicker of a frown flashed over Alexis’s features before she smoothed it away. She opened her mouth to speak, but it was my turn to interrupt. Now a full-fledged frown appeared on her face and on the faces of the two politicians. Creek just continued to glare, and Stewart looked curious. “Prevented how, Chris?” Darion asked, although he already knew the answer. “Explain. We know where the girl is and we know about the security around her. Believe me when I tell you we can take her at any time that we choose,” Creek said. Nobody spoke for several moments. Gleeson started to speak, but Alexis raised one hand toward him without taking her eyes off of me. She finished and took a sip of water, coolly watching me for a reaction. I’m not sure how I looked because inside, I was struggling with Grim while working through the implications of her little speech. We had discussed all the military and law enforcement angles, but not this. I ransacked my brain for a solution, for a hole in her attack, but nothing appeared. “Ah, then you shouldn’t threaten my Chosen, my goddaughter, or my family,” the maid said in an arctic voice. Wind whipped across my face as she circled the room too fast for the humans to follow, the three remaining guards slumping to the ground as she passed them. They looked dead, but their continued heartbeats told me she had just knocked them out. Next was the rustle when she pulled off her gray wig and then the sound of the Velcro ripping told me the uniform was being dispensed with. The faces around the table reflected shock and surprise and fear. “Hi, I’m Tatiana Demidova and since you’ve just threatened to destroy my family, I felt I ought to join the discussion.” She moved up behind me and put both hands on my shoulders. Normally I would offer her my chair, but I could tell through our link that standing was a strategically dominant position and I was pretty sure she was ready to dominate the bejebbers out of them. I could hear all their heartbeats and outside of a Zumba class, I don’t recall ever hearing any beat quite as fast. Creek looked pained as he looked from Stewart to Tanya at my side, but after a moment he reached into his hip pocket—slowly, with his other palm up toward my vampire—and pulled out his wallet. He slipped out a crisp twenty and handed it to Senator Gleeson, with a brusque wave to indicate that Gleeson should pass it down. The bill traveled down the table to McFeeney and next to Alexis Bishop, who blinked rapidly several times before putting a semblance of her former poker face in place. She handed the twenty spot to Nathan Stewart, who added it to a fat roll of bills from his pocket. Even as it left her hand, Alexis was turning her attention to me, the wheels almost visibly moving behind her mask. “Do you agree with her?” she asked me. I paused for a moment, thinking about the whole situation, studying my hands that were flat on the table. As I started to answer her question, I picked up one of the plain water glasses in front of me. The little block of glass was now roughly humanoid shaped. I set it down and picked up the open-ended cylinder that had been a glass. “And guess what? Halloween is approaching. A friend recently pointed out that the barriers naturally thin at that time of year. How do you think that’s gonna go?” I traced an arched triangle into the glass—sort of a dolphin fin shape. It fell out of the cylinder. “My business is about to see its busy season—possibly the first and last at the same time.” Turning the glass, I cut the same shape out of the other side. Holding the first one up to the little glass man, I focused my aura on a spot on his back, pressing the triangle against it. The glass flowed together. “So to answer your question, I’m okay with it. I’d prefer to go about my business without civilians knowing any different. I’d prefer you to leave my friends and family alone. If you choose to take this route, be aware it will flow both ways. None of you will survive unscathed. If it gets too crazy, we’ll leave. My charge is really the whole planet, not just the United States. At some point, I need to travel anyway. Tanya is right: China and Russia will absorb us without a second’s thought. Did you know that I have a grandmother of sorts in China? Me either. She’s one of the vampire Elders and she wields enormous influence over there. The politicians in that country understand what they’re dealing with and wisely leave her alone. Similar to Russia, where Tanya’s family is from. So foreign travel might be nice. We’ll let you deal with demons on your own.” The other triangle got the same treatment, the glass melding together. “Ms. Bishop, before you go back to the evil plots blackboard, do me a favor. Borrow some footage from Nathan here—study that other threat we’ve been talking about.” Director Stewart didn’t look up; he was still studying the glass figure I had in my hand. I looked back at Bishop. “Then picture your friends and family right in the middle of one of those portal openings. See how you feel about me then,” I said, setting the little winged glass man down on the table in front of her. Finishing my turn, I took Tanya’s elbow and we walked out of the room, stepping into a hall of screaming mini-cheerleaders. We turned the corner and moved to the stairwell. Once through the door, we headed down into the basement. I stepped off the stairs and stumbled, a wave of dizziness mixed with doubled vision slamming through me. The God Tear necklace on my chest suddenly burned hot—for just a second, before it all passed. The disorientation left and my vision cleared as the silver-wrapped jewel around my neck cooled to normal temperature. “Somebody just tried to kill Toni,” I said, meeting bright blue eyes.